The Masai (Maasai) are an African ethnic group located in Kenya, Eastern Africa. What's surprising about them is that there is no even one person suffering with high blood pressure, high cholesterol, myocardial infarction, and obesity. Do you believe that? Go to the tribe of Masai people and see it with your own eyes. Why is it so? Are their health conditions perfect? Do they live longer than us? I can say that the answer is 'Yes'. Look at the above beautiful and young lady. You never can see fat women there. Men and women alike are all slender and tall with handsome faces. But it does not mean that diseases do not exist there. Some sanitary conditions and other factors can lead to racial diseases. However, most illnesses they suffer can be treated with their traditional medical cares. What is the mysterious clue behind them? The secret of Masai lies on the food they eat. From over 40 years of study done by Japanese doctors reveal that foods we eat influence our health dramatically. First, an average people take about 7.5–12 grams of salt a day while Masai people take about 2.5 grams only. 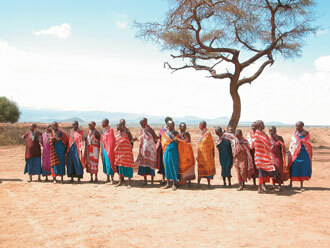 Second, we drink 200–500 ml of milk a day while Masai people drink about 2–3 liters of cow milk. Aside from it, most cows' milk is converted to yogurt by natural means. Third, cow's milk lacks vegetable fiber, iron and other minerals; however, Masai people mix cow's milk with cow's blood each morning especially among babies and mothers. Cow's blood contains enough protein to support our health. There are also tribes in Siberia and Russia where people with long life exist. Their blood pressure is also very low and less cholesterol. We understand that their daily foods are very similar to that of Masai. Sheep milk and its blood, and yogurt made from sheep milk are their meal. Note: Older peoples in the Masai tribe and Siberia are believed to be more than 100 years old, although they were not able to produce any records of their birth certificate for proof. How about raising sheep or goats in your backyard to mimic the life of Masai? Of course, we know that long life and good health are not just because they consume a lot of yogurt everyday. However, it is very good for your health and to have a longer life. Environments and racial characteristics may also be factors in a long life span. Such as in Okinawa, Japan, where people live over 100 years, although they do not consume yogurt but a lot of seaweeds (kelp) everyday. Aside from that, other important factors that may contribute in long life span are brain function and less stress. Yes, these people laugh and smile more often compare to the civilized and educated one. Do you believe that living in a primitive way makes more enjoyable living without stress, and greatly activates the brain? We civilized citizens cannot enjoy and laugh with a single bottle of cheap local wine, but those people in their tribes are satisfied with a cheap homemade native wine. It makes their health and life span different, doesn't it? It is just the matter of choosing whether "you like to be with a lucky life" or "you like to be with a happy life". If you choose to have a lucky life, then, go to the civilized world and be educated. If you want to have a happy and long life, then stay with primitive and traditional way of living :). It's so difficult to obtain both lucky and happy at the same time, isn't it? Also remember that it is necessary to know more definite answer for long life span; but we must also study about what does really make our life span short. Research shows that PYRO-ENERGEN can help improve pH balance, reducing acidity. Having an ideal pH balance is another factor in a long life span.